Google Talk Guru is a new Google bot that lets you ask simple questions. It's "an experimental service that allows people to get information like sports results, weather forecasts, definitions etc via chat. It works on many popular chat applications that support Google Talk." 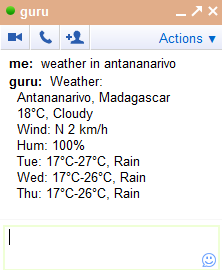 Send an invitation to guru@googlelabs.com in Gmail Chat, Google Talk or any other Jabber client and find simple facts like "weather in London", "amplitude definition", "translate souris", "2^8", "web stanford" (which returns the top Google result for [stanford]). The service is not as powerful as Google SMS, but it's still handy. I tried it is a good start but needs lots of work. If Google can get "I'm Feeling Lucky" result for every query it can give better answers. I like this bot along with other language bots they have in Google Talk. Cool! I wish it would also translate words but for a quick dictionary reference it's nice. I agree with cgull. For example, I wanted my local weather in Fahrenheit and I received an error. I also asked for my favorite hockey team's current record: no dice. Maybe guru will prove more useful, down the road. For now, I think I'll spend the extra 1.5 seconds and type my queries in the omnibox or go to Google.com. Any way to get it give temps in Fahrenheit? It's using Google SMS services. So pretty limited, at least for now. Wolfram Alfa's Chromey Calculator is much smarter. Hope this improves. jasonvaritekfan, since 3 or 4 years you have translation bots for some languages. They work fine. Isn't this just an implementation of Aardvark (www.vark.com)? Which was acquired a year or more ago by Google. No, this has nothing to do with Aardvark. There's a huge difference between a bot that answers simple questions and a Q&A service where people provide the answers. Please add converter to guru too! i.e. "130 mph to kmh" would bring the same that it brings in google search..something close to 210 kmh..
Great! there should be keyword for wikipedia articles. Who needs temperature in fahrenheit?!? Celsius is so intuitive!! Water freezes at 0° and boils at 100°. Fahrenheit is so lame!! Its degrees doesn't tell you anything!! In the US, I did a search for "Panama Canal" via guru. The results came back with a "more results" URL pointing to Google Kenya. http://www.google.co.ke ... what is up with that?